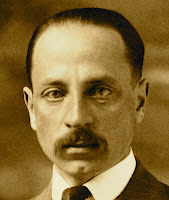 A Year of Being Here: Rainer Maria Rilke: "Departure of the Prodigal Son"
Rainer Maria Rilke: "Departure of the Prodigal Son"
"Departure of the Prodigal Son" by Rainer Maria Rilke, from A Year with Rilke: Daily Readings from the Best of Rainer Maria Rilke, edited and translated from the original German by Joanna Macy and Anita Barrows (HarperOne, 2009). Text presented here by editor permission. Art credit: "Frayed rope about to break isolated on blue background," image by unknown photographer.